Laura Gutierrez and Connor Walsh in Gutierrez’s BARE at Nicole Longnecker Gallery. Photo by Brad Barber. Jacquelyne Boe, Danielle Garza, Jamie Williams and Catalina Alexandra in Laura Gutierrez’s BARE at Nicole Longnecker Gallery. 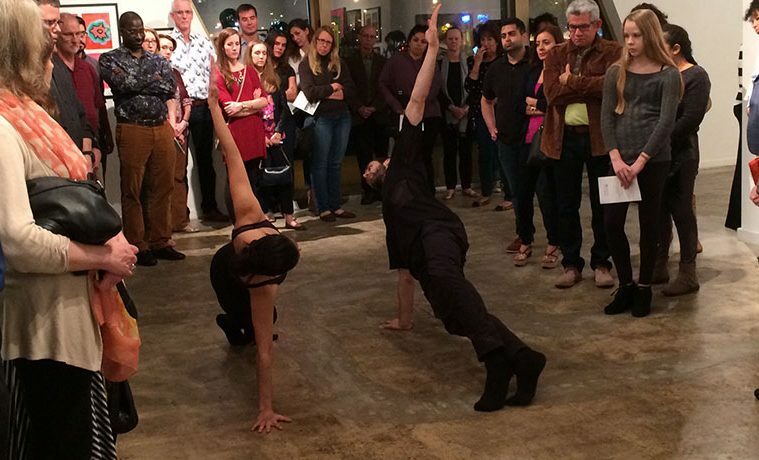 Looking around at the crowd that had gathered to see Laura Gutierrez’s BARE at Nicole Longnecker Gallery, I couldn’t help wondering, “Where are these performers going to dance?” It’s as if 50 people were hanging around on stage before the show started. My fears dissipated when a single file line of dancers—the wonderful Catalina Alexandra, Jacquelyne Boe, Danielle Garza and Jamie Williams—started walking straight toward the thickest part of the crowd. Alexandra led the pack with her intense gaze indicating in the most direct modern dance speak, “Please, move out of my way.” So within the first few moments of the Group section of BARE, it was clear who was running the space. When the audience first parted to let the dancers through, I realized we were complicit in BARE, as these exacting performers never once let the presence of a mass of people sharing their space seem like a hindrance. In fact, the dancers seemed to relish bolting through bodies, generating giggles from the crowd here and there. After a while, I started to see the haphazard scattering of the audience as a potent contrast to Gutierrez’s cleanly formed choreography. At times, the audience seemed like billiard balls on a pool table darting out of the way of a charging white ball. Catalina Alexandra, Jamie Williams, Danielle Garza and Jacquelyne Boe. Gutierrez maximized the design of the gallery, using the long hallway as a focal point, the nook near the back as a place for unison and cohesion and the front windows as a place for sculptural exploration as the dancers tried to squeeze themselves into the window frames. (Some disclosure: I connected Gutierrez to Nicole Longnecker Gallery, in part because I knew she would flourish in an architecturally complicated environment.) 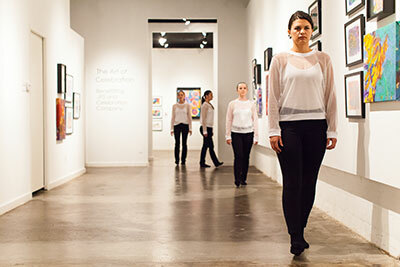 Dancing in a gallery is nothing new, but it’s rare to see this amount of consideration of the specific environment. 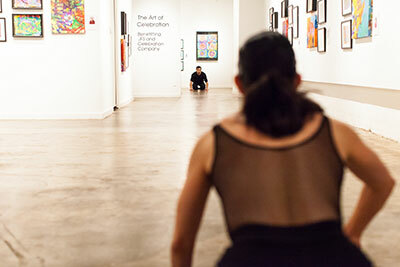 The gallery itself, along with audience, had a presence in the event. In addition, Gutierrez’s movement choices took into consideration the other elements, from roaming viewers to the art on the wall. Influenced by Merce Cunningham and her work with Jonah Bokaer, Gutierrez is defining her own choreographic voice in BARE, and it mostly definitely doesn’t happen on a traditional stage. She’s interested in how a straight line of a dancers echoes a wall. She’s not afraid of stillness, silence and the power of shape without action. A circle of a foot, a turn of a palm and a re-adjustment of hip placement are just a few of the snazzy details she peppered her dances with, all of which draw the eye and interest to the body as an compelling object. Connor Walsh and Laura Gutierrez in BARE at Nicole Longnecker Gallery. But it’s in the floorplay where Gutierrez really shows her strengths as a dance maker. Utilizing the slipperiness of the concrete floor, the unique vantage point of the audience’s ability to easily look down (floor work can be lost on stage due to sight lines) and the power of perfectly timed unison, Gutierrez crafts finely sculpted lines, rich with dynamic surprises. Small shifts in position of a limb are contrasted with large sweeping gestures that again ask the audience to be aware that the floorspace is now a volatile space. Gutierrez’s duet with Houston Ballet principal Connor Walsh seemed cut from the same exacting cloth as the earlier work, but added in the structure of a duet. As Gutierrez was named one of “25 to Watch” by Dance Magazine in 2014, Walsh, a Pointe Magazine 2014 Stand Out, it’s no wonder they are well matched. 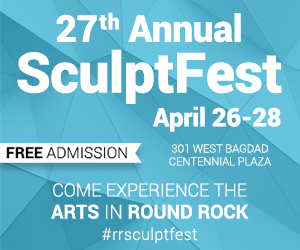 Although Gutierrez is firmly rooted in post post modern and Walsh in classical ballet, they are both known for their precise and measured dancing. Walsh’s razor sharp lines, steadied graze and technical exactitude fit well with Gutierrez’s no frills style. There isn’t an extra movement anywhere. By the time the duet was underway, the audience knew the rules, watch but watch where you are going, too. Again Gutierrez juxtaposed abstract linear gestures with moments of intense connection, setting up a tension of a contest of sorts, the most primal of which happened when they were crouched on either end of the gallery in a ready to spring position. Whether Walsh was throwing Gutierrez down his back or in a tight handhold on the floor, their ambiguous magnetism prevailed. Connor Walsh and Laura Gutierrez. A disciplined use of flow versus shape formed the heart of BARE. A minimalist at heart, Gutierrez punctuates her dances with moments of human connection and the fact that she lets us walk around her dances soften what might be considered an austere edge. The choice of silence for both sections of BARE was a solid one, which allowed the ambient sounds from the nearby Music Box Theatre and traffic to flow in and out of our attention with an eerie quality. BARE is a huge step for this rising young Texas choreographer. I only wonder where the audience and her fine dancers will share space again next.